The park of ‘Jurassic World’ was re-created using an abandoned New Orleans attraction devastated by Hurricane Katrina. I drove out to the abandoned amusement park originally called Jazzland during a trip to New Orleans earlier this year. Jazzland opened in 2000, was rebranded as Six Flags New Orleans in 2003, and was damaged beyond repair a decade ago by the flooding caused by Hurricane Katrina. But in the years since it’s been closed, it has undergone a rebirth as a filming location. It serves as the setting for the new Jurassic World. 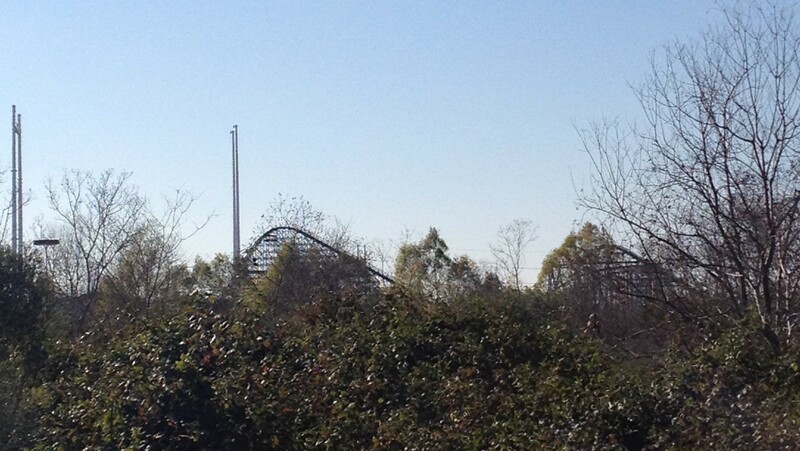 As I approached the former Jazzland by car, a large roller coaster arced into view. The park, just off Interstate 10, was built on muddy swampland. I have read accounts on urban exploring websites by people who’ve sneaked into the park that say it’s overrun with alligators and snakes. After the natural disaster the area wasted no time in returning to its primeval state: a genuine Jurassic World. It was in the Jurassic era when crocodylia became aquatic animals, beginning to resemble the alligators currently populating Jazzland. I saw birds of prey circling over the theme park as I reached the front gates, only to be told in no uncertain terms that the site is closed to outsiders. I pleaded with the security guard that I am a journalist just looking for a location manager to talk to, but was forbidden from driving past the very first entrance into the parking lot. I could see the ticket stands and Ferris wheel, but accepted my fate and drove away, knowing I’d have to wait for Jurassic World to see Jazzland. As I drove off the premises, I could still glimpse the tops of the coasters and Ferris wheel, obscured by trees. I am fascinated by theme parks that return to nature, since the idea of a theme park is such an imposition on nature to begin with — an obsessively ordered attempt to overrule reality by providing an alternate, superior dimension. The idea of Jurassic Park is, among other things, a parody of Disneyland,1 although Disneyland has yet to be destroyed by rampaging Mickeys. Disneyland’s Main Street USA is a re-creation of Walt Disney’s childhood home of Marceline, Missouri, at the turn of the 20th century, romanticized through a theme park lens. It marks the entrance into the regimented, safe fun of the Disneyland park experience — it’s the opening shot. At Disneyland recently, walking down Main Street as the park let out at midnight, I whispered to my friend, “We’re inside a dead man’s memory.” With its whole-milk-fueled wholesomeness, Main Street always feels like the eeriest part of the park, much spookier than the Haunted Mansion. It houses the animatronic Abraham Lincoln, one of the park’s earliest innovations. It feels especially uncanny to stroll past the olde-tymey candy shops and penny arcade. I also have this feeling watching movies — that I am in somebody’s else’s mind temporarily. Theme parks, which amount to giant immersive art installations, are cinematic experiences. And even in the most well-tuned theme park, things still go wrong — rides close down, kids start crying. The Jurassic Park franchise and Disneyland alike are driven by that sweet spot of fear and possibility, the weird back end of the human mind. There aren’t that many movies about theme parks, and at least three of them are based on Michael Crichton properties: Jurassic Park, Westworld, and Futureworld. Jurassic Park is essentially Westworld with live dinosaurs instead of robotic cowboys; otherwise, the song remains the same: You mess with the bull (attempt to best nature), you get the horns (fucked). Coming-of-age-while-working-at-a-theme-park movie Adventureland was lensed at Pittsburgh’s Kennywood. Tobe Hooper’s creepy carnival horror movie The Funhouse was shot on sets built in Florida, although like Disney’s Something Wicked This Way Comes (based on the Ray Bradbury book) it’s about the particular horrors of a traveling carnival. Walt Disney found the seediness of carnivals unseemly, which was part of his desire to build Disneyland — to make a carnival without the tinge of sleaze. One of Disney’s biggest hits ever, 1940’s Pinocchio, features a dystopian carnival-style theme park called Pleasure Island that lures in children with the promise of endless indulgences, then turns them into donkeys. Disney helped usher in a new era of safe, family-friendly attractions in the latter half of the 20th century. Parks of all types sprung up around the country, many of which ended up as locations for films and television series. 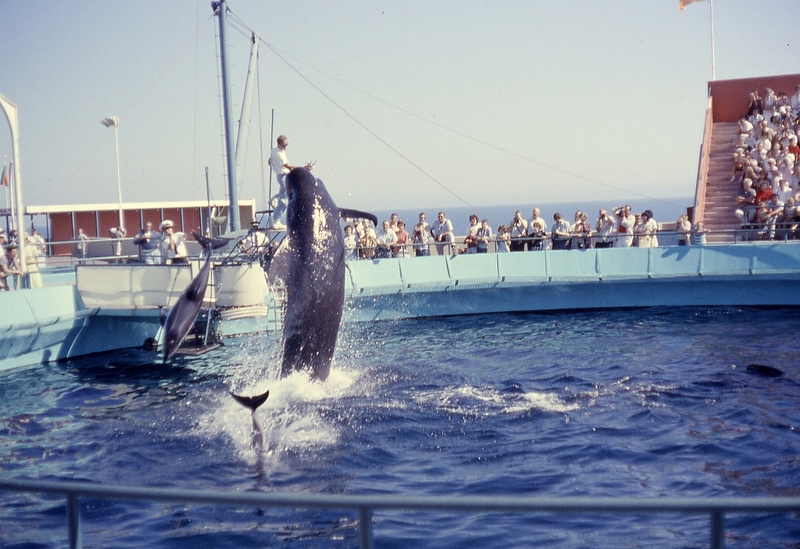 Marineland of the Pacific, a Palos Verdes oceanarium, appeared in countless TV episodes before its closure, serving as a picturesque backdrop in shows like The Beverly Hillbillies, Sea Hunt, Route 66, and The Six Million Dollar Man. After it closed in 1987, the vacated location was used as a film set: The first three Pirates of the Caribbean movies all filmed there, as did The Aviator and Charlie’s Angels. There are signs of former aquatic tanks, but it has largely reverted to its original state: a cliff overlooking the ocean. There’s a basic human impulse to experience nature and take pleasure in feeling overwhelmed. But there’s an equally basic human impulse, it seems, to reconstruct nature and try to improve on it. Theme parks allow us to tour exotic worlds without the perils — the Jungle Cruise removes the danger but maintains the mystique of an actual wildlife park. It provides an escape from reality with the promise that reality will never become threateningly unmoored. We build idealized monuments to that which we often callously destroy in order to build those monuments. The joke of Jurassic Park is that our inability to rein in this impulse is what will eventually lead to our downfall — it’s also the joke of most Werner Herzog movies. There’s something that feels inevitable about watching nature take its revenge, whether it be in the jaws of a dinosaur or a theme park sinking back into the swamp. The Jazzland setting of Jurassic World is complicated by the real tragedy of Hurricane Katrina — which was a reminder that nature is not and will never be under human control, underscored by the careless human error of the Bush administration’s late dispatching of FEMA to the site. But rather than a cruel reminder of the tragedy, the park’s reuse as a film location and job creator serves as an upbeat sign that a new New Orleans and the hyper-successful new “Hollywood South” has risen out of the old New Orleans. During the same trip in which I attempted to hit Jazzland, I went to the New Orleans Zoo to see real alligators and snakes in the flesh. They’re not dinosaurs, but they provoke that feeling of terrified awareness you get in the presence of something much older and more dangerous than you. When I confront the spectrum of life on earth, I always end up ruling in favor of the alligators, wondering why humans even exist. Reading about dinosaurs conjures that same pleasant sense of being infinitesimal, looking at time periods much longer than all of human history and creatures that no living eyes have seen. Knowing a dinosaur could destroy me is comforting somehow. But I also imagine that dinosaurs, like most animals that are capable of but not necessarily interested in manslaughter, would lash out only when provoked. 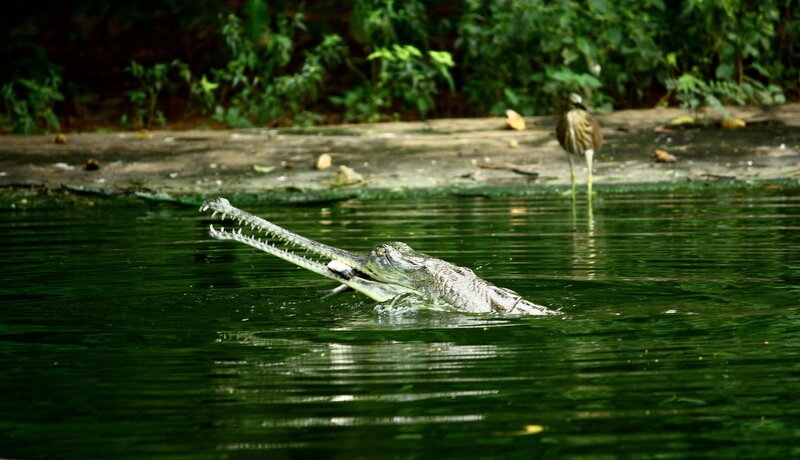 Who needs a T. rex to feel cowed by nature’s menace when we still have gharials? The zoo also has a nontraditional but awesome animatronic dinosaurs section. It costs a few bucks extra to see the Dinosaur Adventure, and curiosity won out. You walk into a birdhouse gone to seed, the birds (living relatives of dinosaurs) nowhere to be seen. The gazebo-like house is staged as if the dinosaurs have taken it over. There are small raptors perched on a fallen tree trunk. Dinosaurs claw from cages, and larger dinosaurs lean over and crane their necks to peer at you. One spits water at guests. It is honestly terrifying. You then walk through an outdoor area where more dinosaurs flap, stare, and open and close their jaws. Although the animals are robotic (and maybe even because they are), there is palpable fear and awe in the dinosaur exhibit. That strange snapping motion that animatronic creatures always have works perfectly for robotic dinosaurs. The artificial dinos are birdlike. They surveil you, but it’s hard to know what they’re thinking when you look into their glossy grape eyes. The Disney parks have their own secret Jurassic Worlds: an abandoned water park called River Country and the shut-off island area of Discovery Island. River Country was Disney World’s first water park, opened in 1976 and shut down in 2001. Discovery Island and River Country are the only two Disney parks to be shut down, and they were both abandoned rather than demolished. There are a number of possible reasons for why River Country shut down: It became outdated after new Disney water parks were built in the late ’80s, and River Country used real, semi-filtered lake water, leading to a boy’s death in 1980 from a deadly lake amoeba. Discovery Island opened as a zoological park called Treasure Island (so close to Pleasure Island) in 1974 and closed in 1999. Disney considered revamping the island based on the computer game Myst, whose setting is a mysterious abandoned island, but nothing ever came to pass. Today Discovery Island is inaccessible, but visible from the shore. River Country is attached to Disney World’s low-cost campground Fort Wilderness, and while trespassing is prohibited, urban explorers have sneaked in and posted photos of the property online. The lights have been left on in River Country. Some of the trespassers have told tales depicting River Country as overgrown and wild — the fake rocks crafted by Imagineers to blend in with the real ones are chipped and peeling. Some extremely brave souls swam to Discovery Island, realizing only afterward that swimming in Bay Lake, which is infested with alligators and snakes, was a really dangerous idea. The explorers traversed the island and took pictures of the real wildlife that prospers there, after the carted-in wildlife was carted back out. They found dead snakes in Coke bottles, empty cages, and a wild island overrun with cawing birds. In the corner of a bamboo hut, they heard noisy activity and discovered two fuzzy baby vultures, real live raptors in a theme park returned to nature. Life finds a way.